CEIR Research Associate Jenny Lovell spent Election Day 2018 in Fairfax City, Virginia, where she was an election officer. She showed up to her assigned precinct before 5 a.m. and worked until after the polls closed to help ensure the election went off without a hitch. Continue on to read more about her Election Day experience! For two years, I’ve worked as an election officer in Fairfax City, Virginia. The precinct I work in is the smallest in the city. Most voters are over sixty-five and have been voting in this precinct for years. The same can be said for my fellow election officers. There is a distinct sense of community here—half the voters walking through the door greet their fellow voters and poll workers with “Hey, neighbor!” The same people bring the same casseroles and brownies they’ve been bringing for years. I don’t live in this precinct, but even I’m starting to memorize names and faces. In our tiny precinct, we experienced much higher turnout this election than we would normally expect. As I checked in voters on the e-pollbook, I watched turnout numbers rise. By the end of the day, including absentee voters, the e-pollbook showed about 62% of registered voters (only those registered, not the full voting-eligible population [VEP]) in the precinct had cast a ballot. High turnout seemed to be the rule this election, not the exception. According to the U.S. Elections Project, about 49.2% of the VEP turned out to vote nationwide. In Virginia specifically, that number reached 54.6%.1 These rates are significantly higher than the 36.7% nationwide turnout in 2014. When I spoke to a first-time voter about the high level of youth turnout, he attributed it to social media and celebrities, explaining that celebrities and his friends online had been emphasizing the importance of voting and encouraging everyone to participate. Personally, I can’t say my experience was any different than his. As an under-thirty voter myself, I too saw a huge amount of social media attention turned towards elections and the importance of voting. In the days leading up to and on Election Day, I couldn’t scroll more than two posts without encountering something about the election. The majority of these posts didn’t even seem to advocate for a particular candidate or party, but simply encouraged voters to turnout regardless of their party affiliation. While there’s been talk of long lines and technology issues in the news lately, I’m happy to say our precinct had very few problems on Election Day. The only time we saw a long line was when we first opened the doors of our polling place at 6 a.m. We quickly processed the initial voters and, while we had steady stream throughout the day, no voter had to wait longer than ten minutes to get their ballot. We experienced no technology issues—the e-pollbooks and optical scanners worked as expected. The voting experience was seamless for the vast majority of voters, although a handful did encountered troubles. The most frequent issue voters had was that they came to the wrong polling place. Thankfully, the city provided our precinct with a tablet so that we could enter voters’ information, find their correct polling place, and direct them to that location. The only other problem I saw was that a handful of people showed up wishing to vote who had not registered to vote yet. Unfortunately, Virginia requires voters to register at least twenty-two days before a general election and does not offer Election Day registration (EDR). However, we can still offer them a registration form and, if they wish, a provisional ballot. In a way, this seems like a good problem to have since it indicates interest in voting among unregistered citizens. This also suggests that bringing EDR to Virginia might be beneficial. Overall, the 2018 midterms were a success in our precinct. While attention is often turned to the rare instances of technology failure, long lines, and other Election Day problems, it is important to remember that there are thousands of polling places running secure, successful elections year after year. In our precinct and many others, the election went smoothly, voters turned out in high numbers—especially young voters, and the few issues that did occur were handled efficiently and effectively. 1 McDonald, Michael P. “2018 November General Election Turnout Rates.” U.S. Elections Project. Updated 11 Nov. 2018, http://www.electproject.org/2018g. 2 “Young People Dramatically Increase their Turnout to 31%, Shape 2018 Midterm Elections.” The Center for Information and Research on Civic Learning and Engagement. 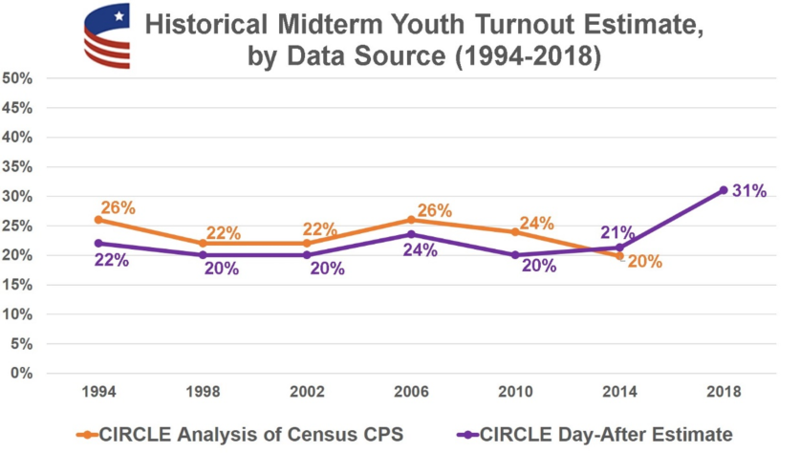 7 Nov. 2018, https://civicyouth.org/young-people-dramatically-increase-their-turnout-31-percent-shape-2018-midterm-elections/.